and what should I do if she does?" Cat ringworm (Dermatophytosis) is not really a "worm," but rather a fungal disease of the skin, hair, and nails. It's highly contagious to other pets and to humans and should be treated as soon as it's discovered. This fungal disease is called "ringworm" because of its circular shape when it appears in humans. It often has a similar shape on felines, too. It starts at a central point, then spreads out in a circular shape. The circular spot is often grey-ish in appearance and has broken off hair on the spot. The hair breaks off because the fungus actually lives on the hair, not the skin, and causes the hair to break off. The irritated skin area can become reddened and thickened. It can also look like tiny pimples and scurf on your cat's skin, or when it's really bad it can appear as moist sores spreading outward. You might find the patchy areas on various parts of your kitty's body, but they typically are found on the head, ears and legs. You may not notice a lot of itching or other signs of ringworm on your cat, so it's a good idea to inspect your feline buddy regularly for signs of this fungus, or other potential health problems. If the patchy circular spots are found all over your kitty's body, this is a sign that his or her health is not at its best. Felines who are stressed, weak, sick, under a year old, or senior cats are those most susceptible to severe infestations. Cats and other animals (and you!) can catch cat ringworm directly from contact with other pets AND indirectly from bedding and other things that have been contaminated by an infected animal. This even includes your kitty's food and water bowls, or any place you might find your cat's hair. The spores of this fungus can survive for more than a year. So you must thoroughly clean anything that has been contaminated with the skin cells or fur of infected pets. As with most health issues with your kitty, you should have your veterinarian diagnose cat ringworm. Sometimes a vet will give you a diagnosis just by looking at the lesions, but more likely he or she will use a special light on the area to confirm the diagnosis. Some veterinarians might also want to do laboratory tests; while these are more accurate, they take longer for a diagnosis, plus cost you more money. However, they are the only way to be absolutely certain of the diagnosis. Your veterinarian may also suggest doing a lab test later to see that the infection is completely gone. Knowing this can give you peace of mind, especially because eradicating the fungus throughout your living environment is quite the task; you really must diligently clean and watch for recontamination. Cat ringworm is treated with a fungicide. Depending on how severe the infection is, the treatment may be in the form of baths with a fungicidal shampoo or rinse, external applications of the fungicide, and pills. Sometimes the treatment will be given for several months to make sure the fungus is totally gone. Your veterinarian will give you a prescription for the medicine, and most likely be able to fill the prescription for you on the spot. You'll want to start the treatment right away, but to save money you can also have the prescription filled at a discount pet pharmacy if you have one in your area, and you can order refills online at discount pharmacies such as 1800PetMeds, but you should probably get the medication asap. Unfortunately, completely getting rid of ringworm is not as simple as giving your kitty medicine (which isn't always that simple!). In addition to treating your cat, you must treat the entire environment to get rid of the spores and prevent reinfection. Treating the living environment can include washing bedding with a disinfectant soap that kills the spores, using diluted bleach on some items, and getting rid of things that you're unable to thoroughly disinfect. Cat ringworm is highly contagious to you and to other animals, and especially to children, so it's a very good idea to wash your hands after petting an animal, especially one you don't know. I pet every cat I see when I'm out walking and the first thing I do when I get home is wash my hands. Felines, especially longhaired kitties, can be carriers of the fungus and not show any signs at all. They can infect you without you being aware that they are carriers. 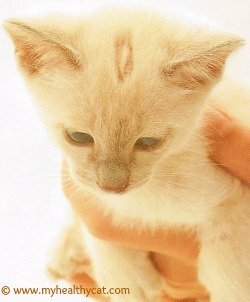 Finally, if after doing your online research to find out whether your kitty has cat ringworm, you decide that it is even a slight possibility, please take your cat to the veterinarian as soon as possible to start treatment and prevent further infection. You want to get him or her on treatment right away, even if it doesn't seem to be bothering your kitty. This fungus can easily spread to other pets, to you, to children, and to your living environment where the spores can survive for over a year! And remember that the information you find on this site is just that: information. I'm not a veterinarian, and I cannot diagnose your kitty. You must see your trusted veterinarian to diagnose whether your cat has ringworm, and to discuss any other feline health concerns you may have. 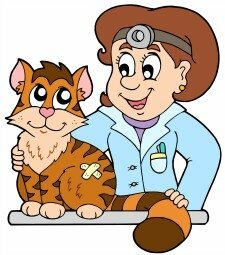 Common Cat Health Problems - My page with the most common concerns kitty caregivers should know about.